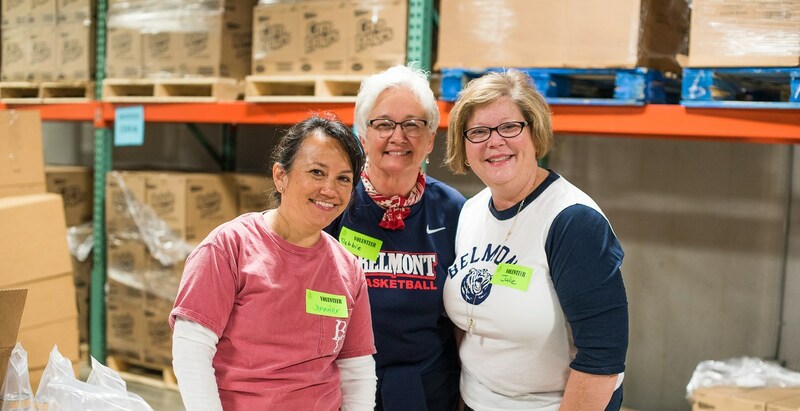 In celebration of Belmont’s charge to be “Nashville’s University,” faculty and staff members left campus on Friday, April 8 and found themselves sorting donated food, packing backpacks with meals and weighing meat in Second Harvest Food Bank of Middle Tennessee’s industrial-sized freezer. The annual service project, which the University dubbed “It’s Bruin Time in the Community,” began two years ago with employees spending a morning painting at Hunters Lane High School. Last year’s project was also at Second Harvest. This year, with Vision 2020 ideals in mind, Belmont employees registered to serve during one of two three-hour shifts, aligning Belmont’s vision and resources with the “ever-changing needs of the people in our community.” Divided into three teams upon arrival at Second Harvest’s Martin Distribution Center, one group was tasked with sorting pallets of food into specific boxes–pasta, rice, snacks and vegetables, among others. These boxes, once weighed, were marked and prepared for shipment to any one of Second Harvest’s many community partners. The next group, decked out in their winter warmest, headed for the organization’s freezer to weigh and pack donated meat. No stranger to the freezer’s sub-zero temperatures, Belmont’s Residence Life Department spent last year’s event volunteering in the freezer and the participants said the team had been looking forward to bundling up for the third annual service day, again. The final group, and the quickest to volunteer when the groups were divided, took on Second Harvest’s “Backpack Program,” a program that provides food for at-risk children on weekends and during school breaks when other resources are not available. This team stocked more than 2,300 backpacks with canned entrees, applesauce, cereal, fruit juice, milk and a snack, contributing to the more than 5,000 hungry children fed by the program each week. In total, Belmont’s “It’s Bruin Time in the Community” morning and afternoon groups boxed more than 12,000 lbs of food, 2,300 backpacks and 7,000 lbs of meat for packing and delivery. For more photos from the event, click here.